Hioki MR8880-20 Memory Recorder med 4 kanaler. 1 MS/Sek. Thanks to its safe, CAT III 600V class design, the MR8880-20 can directly measure high voltages of up to 600V at demanding p/lants and other facilities. The recorder also features an extended operating temperature range of -10°C to 50°C and complies with JIS automotive vibration standards, demonstrating its ability to withstand the harsh measurement environments associated with automotive development. 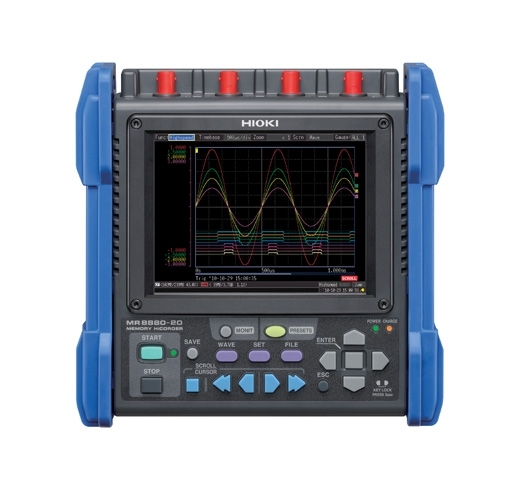 The MR8880-20 can perform isolated measurement using its 4 channels of analog input, allowing it to measure 3-phase power lines. In the past, customer feedback has indicated that electrical measuring instruments are excessively difficult to configure and operate. 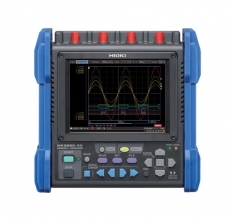 The MR8880-20’s PRESETS configuration navigator function addresses these concerns by allowing users to simply select an application—for example, measuring a commercial power supply or monitoring a line for a voltage drop—and follow the on-screen instructions to configure the instrument. An optional A6-size printer can be used to print waveforms in the field, making it easier to hold effective evaluations at job sites. Data can also be stored in external storage media. Automobile development, malfunction analysis, etc. *Analog input channels are isolated from one another and other device circuitry. Logic input channels share a common ground with the device.